The first game of the Chicago Bears 2017 NFL season is upon us and we are about to see the team the Bears hope will earn a better record than last year take the field. 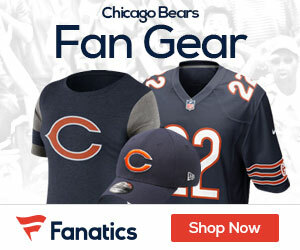 They will play a tough team this Sunday as the Atlanta Falcons come to Soldier Field. The Falcons are going to want to get started on the right foot after getting beat in record fashion in the Super Bowl. They will be out to make everyone forget that game. We have looked at Chicago’s offense and defense but what about their special teams? Can the Bears find some magic there? If the game had to be won on a field goal, could the Bears get those points? What about coaches? Which coach is better? Dan Quinn or John Fox? Let’s look at the special teams, the coaches, injuries and get a prediction in this, the final part of our preview of the Chicago versus Atlanta game. The Bears special teams did well during the preseason as they had a lot of different return specialists trying out for spots. They got some nice play out of everyone they tried but it looks like they are going to go back to at least one of the guys who returned kicks last season. If you look at Chicago’s latest depth chart, you will see that Deonte Thompson is returning kickoffs again. Bryce Callahan is the punt returner. While Thompson has done this for the Bears before this is Callahan’s first real go at it. Last year, Thompson’s average returning kickoffs was 23 yards. His longest was 64 yards while he had 22 returns that were 20 yards or more. Thompson also had two returns of 40 yards or more. He’s not a dynamic return specialist who is going to make a lot happen but he is reliable and right now that’s what the Bears need. Callahan is new to the punt return game and will be relied upon to light things up there. However, with his health history and rookie Eddie Jackson looking good returning punts in the preseason, this may not be Callahan’s job for long. You might even see the Bears throw running back Tarik Cohen cornerback Cre’Von LeBlanc into the mix. At any rate, Chicago’s punt return game is going to be a lot better than it has been in the last three years thanks to all the talent they have. Last season, Atlanta’s return teams were mediocre at best. Former Chicago Bear Eric Weems handled the kickoff return duties and he was let go this past offseason. Atlanta brought in former Detroit Lions’ special teamer Andre Roberts to return kickoffs and punts and he has instantly made their return game better. He had a 22.6-yard average returning kickoffs and a 12.3-yard average returning punts. He scored two touchdowns returning punts last season. Consider him dangerous. When it comes to the kicking game, the Falcons appear to have the edge. Matt Bryant made 91.9 percent of his field goals and all but one of his extra points. He’s spot on almost all the time. 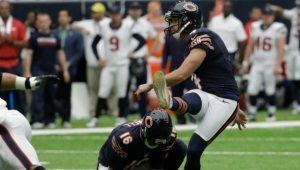 In contrast, Bears’ kicker Connor Barth made just 78.3 percent of his field goals with one missed extra point in 2016. For now, he’s the Bears kicker but he may or may not be their kicker all year. Still, he is their kicker for this game. The advantage goes to Atlanta. 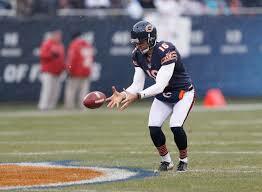 Chicago Bears punter Pat O’Donnell had an average of 44.0 yards with a net of 38.4 last season. His 44.0 average was second to last in the league. O’Donnell had a strong preseason and looks poised to have what might be his best season since coming into the league in 2014. The Bears need him to be better and he needs to have a great start to the season. Hopefully, O’Donnell will start off the year on a high note against the Falcons. Atlanta punter Matthew Bosher had an average of 46.8 in 2016 and was seventh in the league in punting average. He’s going to be a critical part of field position in this game and could be Chicago’s biggest enemy. Special teams may be a huge factor in this game. This early in the season, it’s hard to see who would have the advantage. In the return game, it could be even but with kicking and punting, the advantage goes to Atlanta. 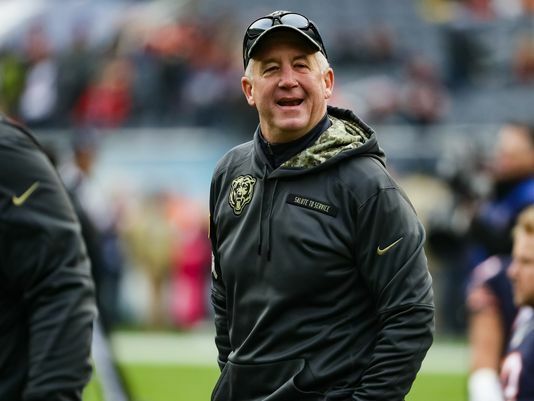 Chicago Bears head coach John Fox has been a head coach in the league for 16 years and has a lot of experience. Atlanta Falcons head coach Dan Quinn is starting his third year as a head coach but has already taken his team to the Super Bowl. He has a promising future and is one of the league’s best coaches. When it comes to experience, Fox has it easily over Quinn but Fox has struggled with decision making and time management. As Bears fans, we have seen his time management skills contribute to the struggles. Hopefully, Fox will make better decisions and not put a potential victory at risk this Sunday. Quinn, despite the fact he has less experience than Fox, may be a better coach, at least in the long run. Who has the advantage at the head coaching position? Quinn’s talent cancels out Fox’s experience. Consider the two even though. The biggest impact injuries of this group are with Long and Amukamara. The Bears can be without Long for a game or two but they are weaker without him. Chicago has good depth but if they suffer another injury along the offensive line they will be in trouble. Hopefully Kyle Fuller, who is replacing Amukamara, is up to the challenge after being out for an entire season in 2016. Out of all the injuries, the Falcons reported all of them are to backups. None of their starters are reported injured. When it’s all said and done, the advantage goes to Atlanta in this game. The Bears will have to play near perfect football to win but they can win it. If their defense can keep Atlanta in check and their offense doesn’t give the game away by mistakes then they have a chance. But it’s a slim one. It’s going to be a tough start to the season for Chicago and unfortunately, they will begin the 2017 campaign with a loss but it won’t be a blowout.